We’re in the home stretch to Biketoberfest 2018 with one week to go! But don’t worry, there’s plenty of time to prepare before hitting the road to Daytona Beach, FL. 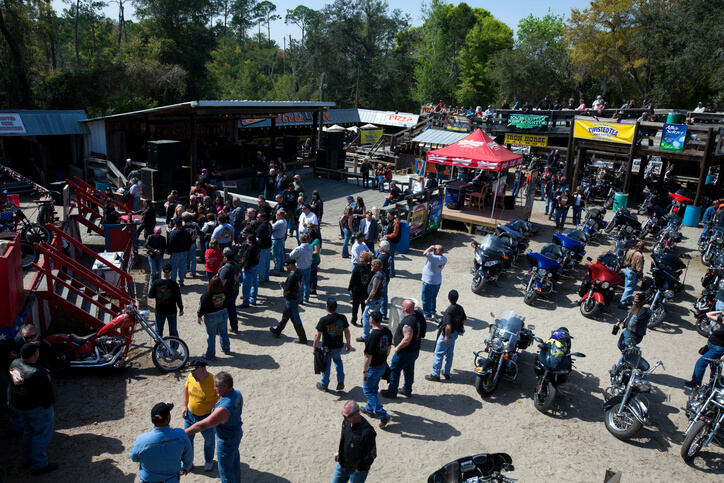 911 Biker Law, a personal injury law firm in Orlando, looks forward to seeing you there! Whether it’s your first Biketoberfest or you’re an annual regular, how you get here is up to you. Many visitors bring their motorcycle with a trailer, and if you’re wondering where there’s parking available, the following is a list of trailer lots close to the festivities. October in Florida is downright beautiful. It’s not too hot during the daytime and evenings are cool and comfortable. If you want to escape the hustle and bustle for an hour or two, here are area rides that are sure to be restorative. Ride by — or stop at — several of the area’s legendary bars and restaurants, such as Broken Spoke and Iron Horse Saloon on this 43-mile route. It also passes three Florida state parks, Bulow Creek, North Peninsula, and Tomoka, which feature lookout points and hiking and walking trails. This 70-mile route is jam-packed with the sights and sounds of the Daytona area. The ride begins at the Daytona Beach Racing & Card Club, located at 960 South Williamson Blvd., Daytona Beach, FL 32114. From there, riders head toward Daytona International Speedway then Blue Spring State Park near Orange City, and Green Springs Park in Enterprise before circling back to Daytona Beach. The words relaxing yet invigorating have been used many times by Biketoberfest visitors who follow this 34-mile route. Soak up the coastline views and recharge at Canaveral National Seashore. Riders may be able to catch a glimpse of launches from nearby Kennedy Space Center depending on the launch schedule. This route takes riders north to America’s oldest city, St. Augustine. A 110-mile round trip, the Old City ride blends city and rural scenery with the chance to take in the many historical locations in St. Augustine. Catch a bird’s eye view of the Atlantic coastline and the surrounding area by visiting the Ponce Inlet Lighthouse. A short, 24-mile route, riders pass several other area attractions, such as the Marine Science Center and Wilbur Rose Paddling Trail boardwalk. Perhaps the shortest ride of Biketoberfest, the Street Festival Ride is four miles of festivity as hundreds of bikes stroll through. The route ties together the Main Street, Midtown Street, and Riverfront Park festivals where food, live music, and merriment abound. Officially known as the Ormond Scenic Loop & Trail, The Loop takes riders deep into the heart of Old Florida along this 30-mile route. Ride under thick live oak canopies and cruise along the Atlantic Ocean or stop and visit the numerous historic dwellings and locations along the way. If you left for Daytona without getting a Free Tow Card, stop by our 911 Biker Booth during Biketoberfest and visit with lead attorney Michael B. Brehne. Learn about our law firm, why we’re ardent proponents of safe riding, and pick up a complimentary free tow card! The card covers the first 10 miles of a one-way tow to the closest repair shop after an accident or mechanical issues. Want your Free Tow Card now? Click on the “Free Tow” tab on the side of our website, insert your information, and get a card!